General Officers of the World's W.C.T.U. Under the guidance of Francis Willard, the Woman's Christian Temperance Union changed its national slogan from "For God, and Home, and Native Land" to "For God, and Home, and Every Land," reflecting a growing concern with temperance work on the international stage. Detached from domestic political affairs by their decision to align with the issue-based Prohibition Party instead of the mainstream Republican Party, the national W.C.T.U. was free to pursue international temperance work unencumbered by partisan politics. The Oberlin W.C.T.U. took up this global temperance mantle, contacting and supporting their "sisters" at home and abroad. This internationalism is evident in the following transcriptions, which include correspondence spanning three continents and minute book entries detailing Oberlin women's engagement with temperance issues outside of their immediate community. The traditionally feminine work of temperance, coupled with the local tradition of commitment to missionary work, gave Oberlin women a means by which to step beyond neighborhood concerns and participate in a broader sphere of international activism. Oberlin women's vision of an international temperance crusade was deeply rooted in the foundational tenants of their own community. The 1833 founding covenant of the Oberlin Colony dictated that community members would "deny [themselves] all strong and unnecessary drinks" in an effort to uphold "the entire influence of the blessed gospel of peace" in their nascent utopia.1 Even at its moment of inception, the Oberlin colony looked forward to extending its moral influence to "the nations of the earth. "2 These hopes were brought to fruition in 1874 with the founding of the Oberlin Woman's Christian Temperance Union. Building upon the precedent of the "Female Moral Reform Societies" that had emerged following the Second Great Awakening, the W.C.T.U. 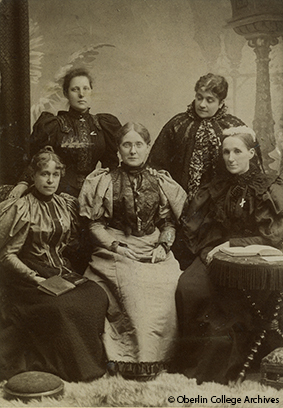 asserted women's roles as the guardians of moral virtue and strove to protect their homes from the vice of alcohol.3 As the college and collegiate institute flourished, Oberlin reformers attempted to incorporate the growing academic environment into the community's existing commitment to moral reform. Like Jane Addams, they attempted to translate academic preparation into tangible change. Fearing that scholastic endeavors alone would "cloud the really vital situation spread before [their] eyes," the women of the Oberlin W.C.T.U. sought to remain attuned to the genuine dangers posed by alcohol.4 Aware that these dangers did not cease at the boundaries of Oberlin, W.C.T.U. members increasingly saw themselves as part of an expansive global campaign for temperance. Ranging in date from 1898 to 1901, the selected documents include minute entries from the Oberlin W.C.T.U. Secretary's Book, as well as letters received by the organization. Unless otherwise noted, the minute book entries were recorded by Mrs. J.A. Hart (1871-1936), who acted as Corresponding Secretary for the Union throughout the dates encompassed in the collection. Both letters transcribed in the collection came from international sources, Mrs. Louise Renthinger of Benito, West Africa, and Mrs. E.V. Bill of Toronto, Canada. The distant locations of these two women inhibited our ability to uncover further information about their lives within the scope of this project. Similarly, since many women in the Union's minute book were identified only by their last names, placing them within the historical narrative proved a difficult task. For clarification purposes, the women for whom we have additional information are distinguished by footnotes within the transcribed documents. While many of the women described in the sources remain relatively anonymous, we nevertheless affirm that this collection of documents holds historical value as an illustration of the broad international mindset of Oberlin W.C.T.U. at the turn of the century. "Covenant of Oberlin Colony," Electronic Oberlin Group, http://www.oberlin.edu/external/EOG/Documents/Oberlin_Covenant.html. Carol Lasser and Stacey Robertson, Antebellum Women: Private, Public, Partisan (Rowman & Littlefield Publishers, 2010), 133. Jane Addams, Twenty Years at Hull-House, (New York: MacMillan & Co., 1910), 68.